Being rich is a good thing. Not just in the obvious sense of benefiting you and your family, but in the broader sense. Profits are not a zero sum game. The more you make, the more of a financial impact you can have." We have many lists like Top 100 richest people of the world or the top 10 riches people of your country. We all know Bill Gates, Warren Buffett, Lakshmi Mittal and the Ambanis that top these lists year by year. 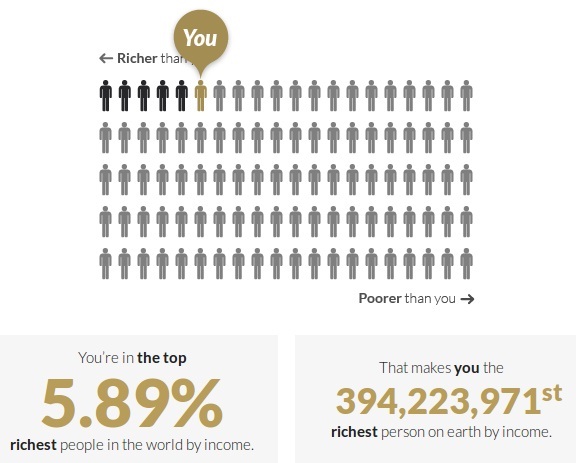 However, have you ever wondered where you stand in the world's rich list ? Well just head over to GlobalRichList and check where you stand in the list. Go to their home page and provide your yearly income and country of residence. 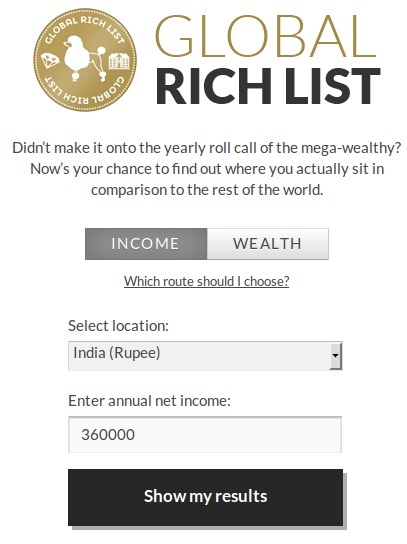 If you have other wealth assets, you need to click on the Wealth tab and provide your details. Finally click on Show My Results and you'll obtain your ranking. It'll also show that how much money you make in an hour. Your income comparison with that of a Ghana Labourer. Your monthly income could pay the monthly salaries of 70 doctors in Azerbaijan. Also if you think you are earning enough money, you can donate some of it right on the same page.